Objectives: Glycodelin is a factor which regulates immunological activity and is required in implantation window. 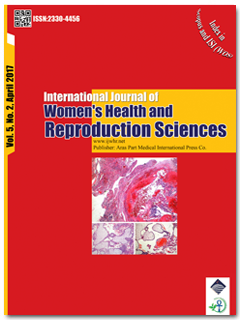 The present study was conducted to compare glycodelin concentrations in blood and uterine flushing samples from women with in vitro fertilization (IVF) failure and fertile controls. Materials and Methods: This was a prospective clinical trial including 20 women with IVF failure and 19 fertile participants. Both groups initially filled a special questionnaire including their demographic profile and prior failed IVF attempts. Then samples of uterine flushing and blood samples were taken to measure glycodelin concentrations. Results: There were significant differences between mean glycodelin concentrations in the case and control groups, both in serum glycodelin (30.1 ± 5.30 vs. 44.5 ± 11.85 ng/mL, P < 0.001), and uterine flushing glycodelin concentrations (310.0 ± 67.51 vs. 498.3 ± 119.01 ng/mL, P < 0.001). The mean total glycodelin concentration in uterine flushing was higher than serum in both groups (399.4 ± 133.95 vs. 36.9 ± 1.52 ng/mL, P < 0.001). Conclusion: We found a significant decrease in glycodelin concentrations among patients with IVF failure. Since glycodelin has a role in immune system during endometrial receptivity, therefore, it may be required for prevention of IVF failures.